The 4th biennial conference of Bhergaon district Koch-Rajbongshi Mulyuva and Mahila Sanmilani concluded at Bengbari in Udalguri district of Assam on Sunday. 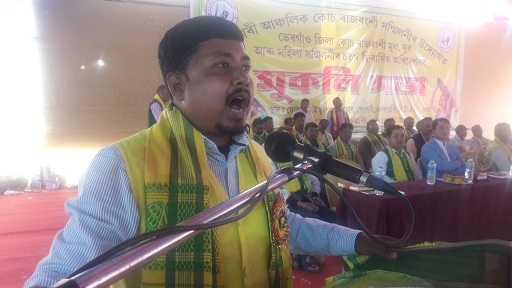 Ray making a clarion call to the people of the community stated that the community which assimilated themselves as being Assamese in Assam, Bengali in West Bengal, Bihari in Bihar and Nepali in Nepal should trace back to their origin roots of Koch-Rajbongshis of the historic Kamatapur state. He further lamented the lackadaisical attitude of the successive governments in securing the rights of the community by granting ST status and Kamatapur state. Earlier, the open session was inaugurated by president of All Koch-Rajbingshi Mahila Sanmilani, Chandra Singh Talukdar. The event was also attended by educationist Binoy Kumar Medhi, vice-president of AKRSU Dibyajyoti Deka, Bhergaon SDPO, Nirmal Ghosh among others.